No baking involved on this one. 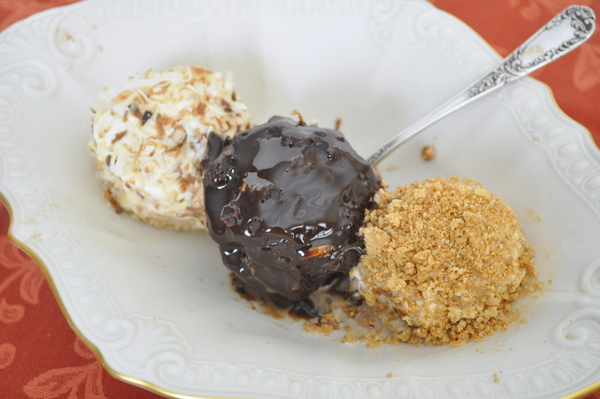 It’s ice cream, stuffed with a surprise and rolled in a topping. It may not cool down the temperature outdoors, but this treat is bound to cheer you on a hot summer’s day. 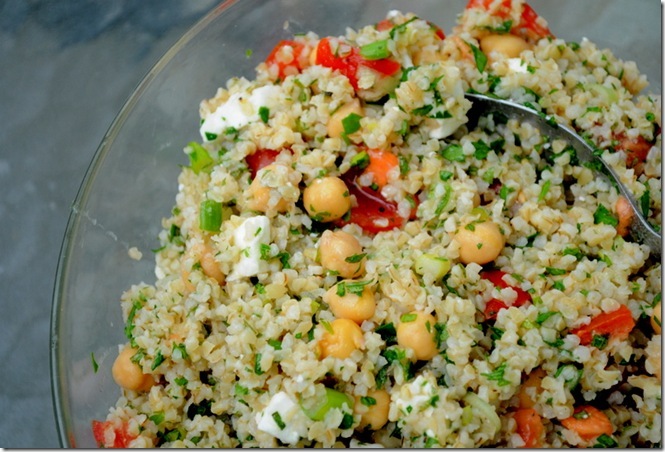 Make a bunch of these ahead of time and you’ve got a ready supply to serve at a fancy dinner party or holiday event too. I used three flavors of ice cream. The first one was vanilla ice cream stuffed with amarena cherries. If you’ve never had these, look for them at a good Italian grocery store, or online. They are nothing like the neon-red maraschino cherries sold in grocery stores. 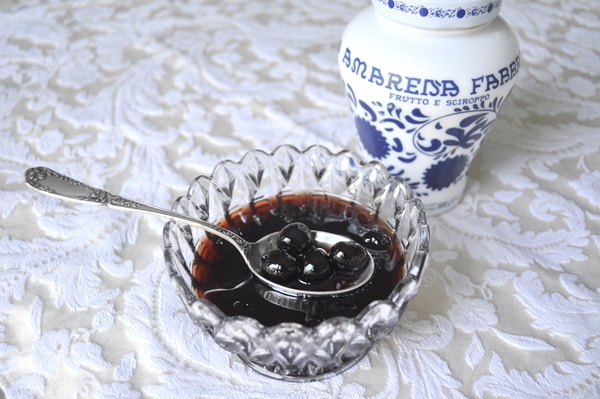 These wild cherries are steeped in a sweet syrup, making the flavor a delicious sweet and sour sensation in the mouth. They’re made in Emilia-Romagna, the region my mother’s from. 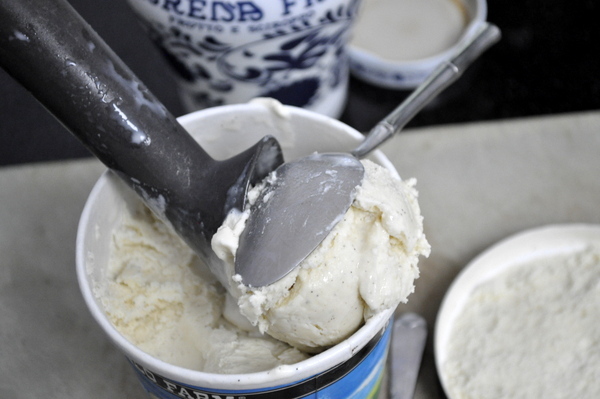 Take a scoop of ice cream, but don’t completely make a sphere yet. Add a cherry or two to the center. Then cover it up with more ice cream. 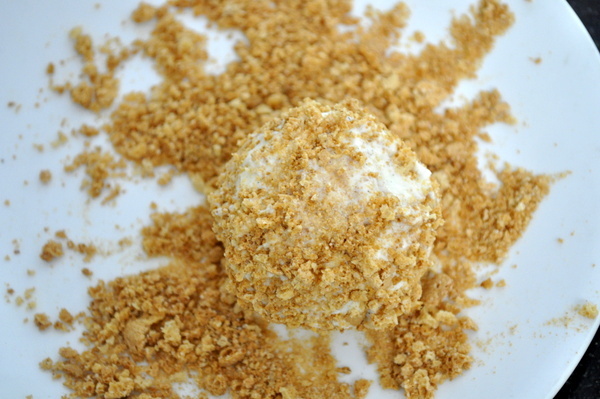 I then crushed some amaretti cookies and rolled the ice cream ball in them. 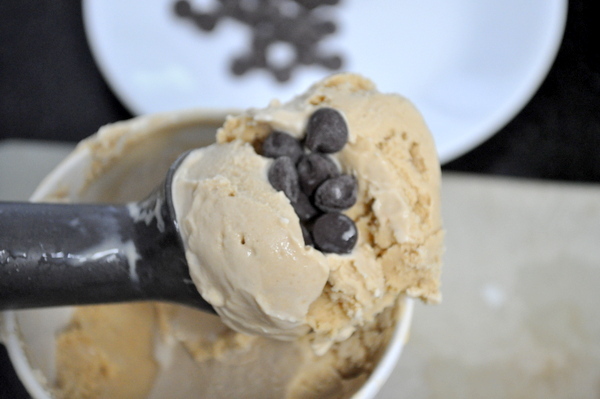 I used small chocolate chips to fill the center of the coffee ice cream spheres. And tried to roll them in hot fudge sauce, but you can see it was initially a mess, since it started to melt the ice cream quite rapidly. I froze them again, then poured more cooled sauce over the top. 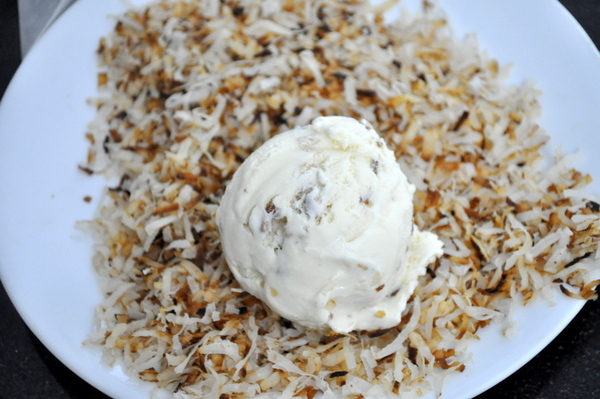 I toasted some almonds for the filling I used with the toasted almond ice cream. Then rolled the spheres in some coconut I toasted. Freeze the balls for a couple of hours and you’re ready to go. It’s hard to say which flavor I loved best – they were all scrumptious. What flavor combos can you think of? Congratulations to Lori Lynn, of “Taste With The Eyes,” the winner of the giveaway for the chitarra maker on my last post. These look amazing! I'm an ice cream fan all year long, but especially in summer. 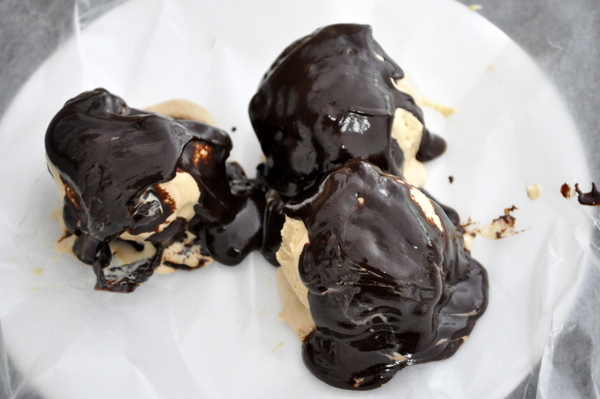 I love tartuffo, my favorite ice cream treat! Hi Linda – I am so excited to have won the chitarra! Thank you so much! I really look forward to making my first homemade pasta! And the recipe for the lamb and peppers sauce (seems like lamb is everywhere I turn these days). 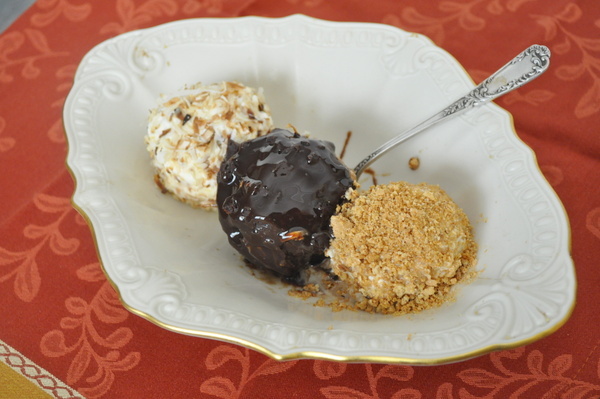 Now about these ice creams…the scoop with the amarena cherries and crushed amaretti cookies needs to be served at my next party! Love your darling ice cream bowl too. Thanks again for the chitarra, YAY! Great ideas! I love the one with the crushed amaretti cookies. Congrats to Lori Lynn, I can only imagine what she'll whip up with that! Now for your little ice cream treats, these little darlings will be showcased here real soon! Triple yum! che golosi, ne mangerei subito qualcuno! Hi Linda, Fsrt, congratulations to Lori Lynn. Lori, you will absolutely love your chitarra. It is a real beauty. 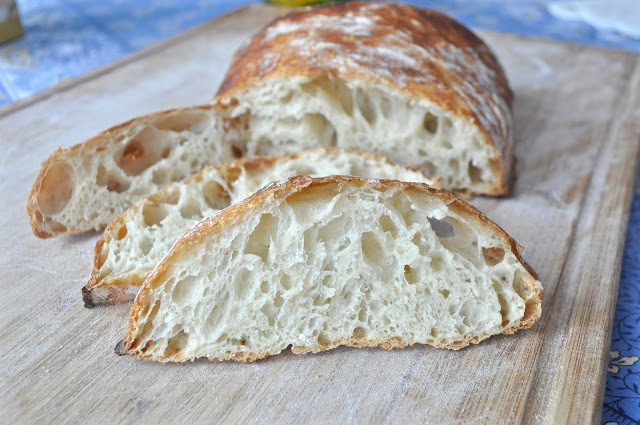 You will love it, and I am thrilled that another woman will carry on the this traditional food of Abruzzo. Congratulazioni! And Linda, this is such a wonderful idea. 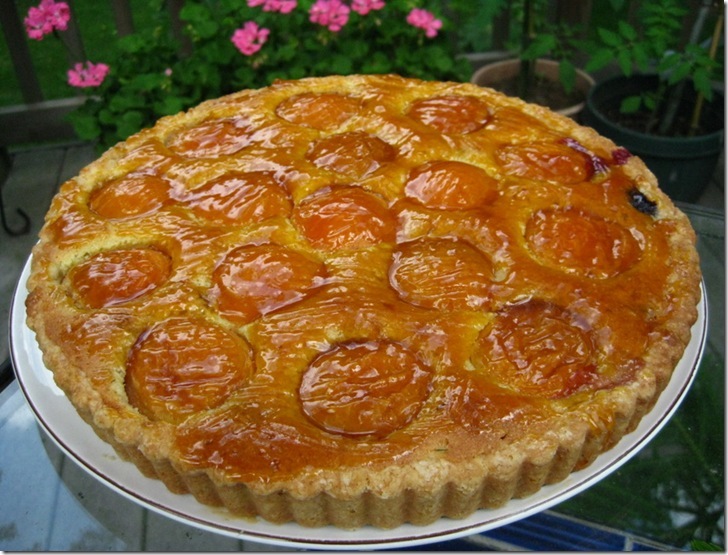 It looks great, and I am confident it will taste even better. 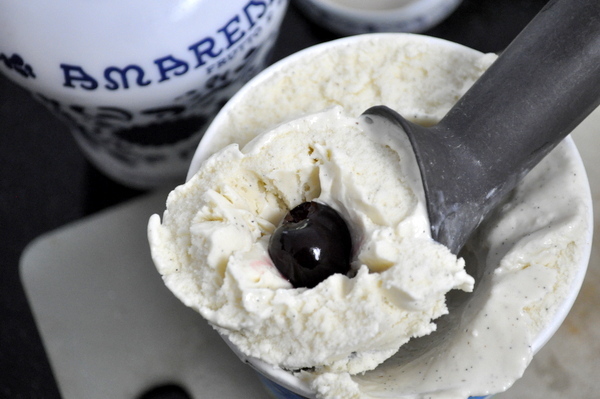 Amarena cherries are wonderful, so flavorful. I can't wait to try this one. Thanks for a terrific post. Huge congrats to Lori Lynn! Yay Lori! The treats come to me at a vulnerable time – after one month of savory, I woke up to craving a sweet. Haven't been able to fulfill it yet but now – thanks to you – I know what it will be. 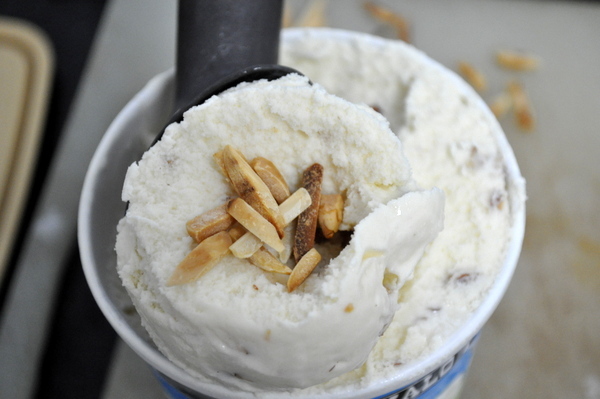 I have a huge weakness for toasted almond ice cream. I will try to look for those cherries – they sound wonderful! All of your scoops look fantastic. Yummmm! What a creative way to eat ice cream. I want this now!